HCA Skin Care Center’s leading-edge technology in phototherapy BBL is an outstanding method to remove unwanted hair. Our award-winning manufacturer, Sciton, is a leader in the laser and light arena. As a result, our method for light and laser hair removal is both effective and painless. 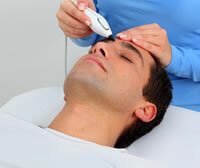 Using laser and light therapy to remove hair is simple and produces lasting results. The light energy is selectively absorbed by the melanin in hair follicles and converted to heat, diffusing to and injuring stem cells in the bulb and bulge. Effective hair reduction can only be achieved during the active growth phase. Our professionals will calculate when this growth phase occurs to make your treatment as effective as possible. Hair reduction is considered permanent when a significant amount of hair does not return for a period of time longer than the complete growth cycle. After a series of treatments, most, if not all, hair is permanently removed. However, if hair does regrow it will be finer and lighter than before. During our initial FREE consultation, we’ll recommend the program best suited to your hair type and location. Laser hair removal has become one of the most popular aesthetic treatments in Grand Rapids and in the US. Holistic Care’s FDA approved hair removal laser enables us to treat all skin types for men and women safely and effectively. The key to getting the results you want is to find a program tailored to meet your specific needs. Our team at the HCA Skin Center in Grand Rapids will listen and talk with you about your aesthetic goals, then work with you to design a custom treatment package. Contact us by email or call 616-361-9221 to schedule your FREE hair removal consultation.